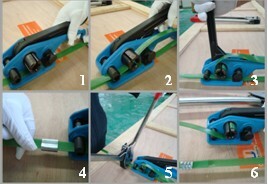 PET Strapping Tool-TOPSORB TECHNOLOGY CO.,LTD. PET strap, Bind-Force is mainly made from polyethylene glycol terephthalate (English abbr. 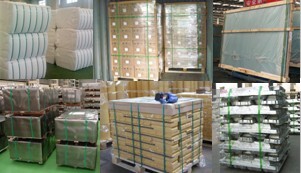 PET), a popular new type packing material on the international market. With its advantages of low cost, nice and durable, environmental-friendliness and recyclable, high automatic operation, it is widely used in the fields of steel, alloy, chemical fiber, cotton spinning, tobacco, paper making, metal canning, etc. PET strap is ideal substitute of steel strap. In U.S.A and Europe and other developed countries, with the increasing consciousness of safety and environment protection, safe and easily recycled packaging materials were required to be used by force. For heavy and large-sized cargo, there was only steel strap in option. In 1999, PET strap was born. In a couple of years, it has been spread over the world and widely used as a substitute of steel strap in paper, wood and steel industries. PET strap's advantages：It has tension resistance as strong as steel strap, also extension ability of shock resistance, giving more insurance to your cargo transport. Small extension rate：Only one-sixth Percentage of elongation polypropylene (PP) straps. Keep Long time tensile force. High thermotolerance: melting point 260 degrees, not distorted in form lower than 120 degrees. Good flexibility：No sharp edge like steel strap, safe operation, not harmful to hands and package. Nice & Rustless：No trouble of the rust stain on package coming from steel strap. Bright in color. 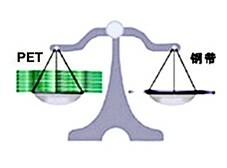 Economical：1 ton of PET strap is equal to 6 tons of steel strap in length. 50% cost can be saved comparing with steel strap. 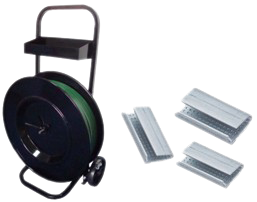 Strapping cart： is used to carry PET strap, seals and related tools in the packaging work. It helps to move PET strap roll freely and prevent PET strap from pollution or being messy and loose. 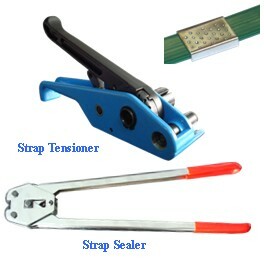 PET strapping toolconsists of strap sealerandstrap tensioner specially designed for PET strap. It is your first option of packing due to easy use, very low malfunction, no need operation training, adaptable in tough working conditions. It saves 20cm in length each time comparing to steel strap. 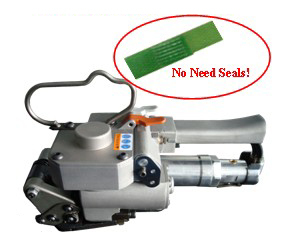 PET strap tensioner： It major parts are made of precision-cast aluminum. Coherent operate on tensioning, unbracing and cutting. Easy operate and Durable service. It is available for straps in 9-19mm width. PET strap seale：Especially design on major parts, with balanced tensioning, smooth bending. Easily use. Nice stainless surface. 3.Grip the tool, pull the bar until PET strap becomes tight. 4.Put one seal on PET strap, with opening down. 6. Press the tensioning bar, cut the strap off, and remove the tool to the right side. It is made based on Swiss technology, and used with air compressor. It takes use of high pressure air source to achieve high-speed taut friction welding.Compare with manual PET strapping tool, it combines the functions of tightening, welding, cutting, finish these operations one-time. It works efficiently with smooth and strong welding connections. No need use strap sealer and strapping seals! Save your time and reduce your cost. It is widely used in the packaging of light steel, metal, papermaking, stone products etc.